Ivy, Oak and Sumac, Oh My!!! Before we get started, I’m not a doctor. Some people are seriously allergic to these plants. I’m obviously not talking to them. You need to get yourself to an emergency room, or a doctor ASAP, and get off the internet, if you are having any unusual, extreme, or frankly, any symptoms that would make you concerned. Again, I’m not a doctor, so I’m only giving some helpful advice here, not medical advice. And certainly not personally specific medial advice to you! 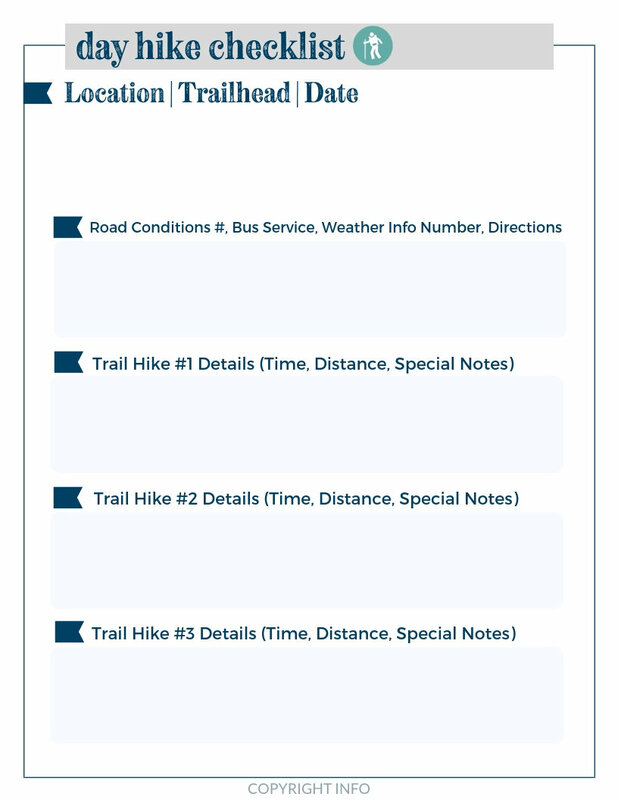 Poison Ivy, Oak and Sumac…..Oh My! It’s the trifecta of poisonous plants, that cause itching and burning and can put a huge damper (or even ruin) your vacation! The rash is caused by an oil called urushiol (yoo-ROO-shee-all) in the plant’s leaves, stem and roots. Just a tiny amount (the size of a grain of salt) will cause a severe rash for about 85% of us humans. You need to learn to IDENTIFY AND TREAT these rashes. 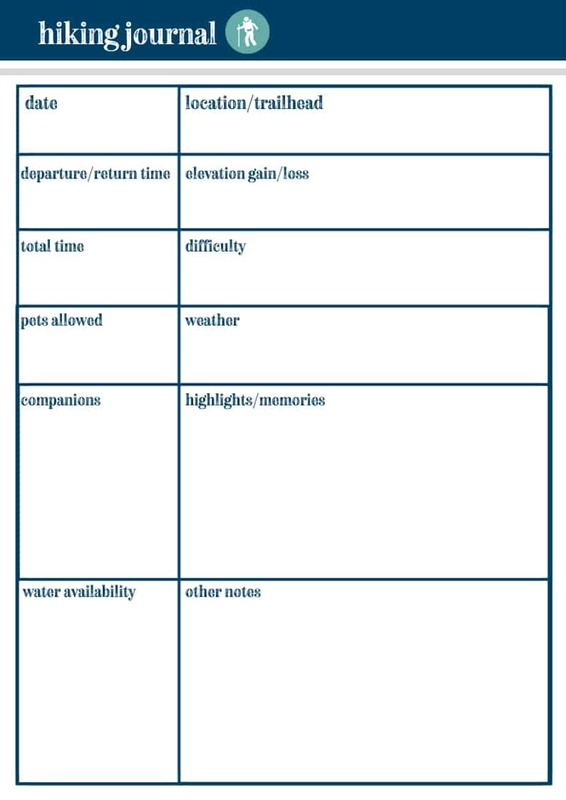 Hopefully, you never have to deal with that last one, but we are giving you the tools just in case. The Poison Ivy plant causes rashes, hives and other allergic reactions. We’ve all heard it. Avoid it. But what does poison ivy really look like? There are a LOT of leaves that have three. Or sort of look like they have three. Sometimes it’s hard to tell, isn’t it? Poison ivy is found pretty much everywhere in the United States. Sure, its in the woods, on hiking trails, but I’ll be honest, we have some on the side of our house! (yikes!!!) It grows EVERYWHERE. So, you need to be able to identify it. As we all know and have heard the saying “leaves of three.” This little saying is actually TRUE in this case. These leaves do grow in clusters of three on vines that grow on trees (sort of like ivy) or on trails along the ground or bushes, etc. Listen CLOSELY. Every single part of this plant is poisonous. It all contains that urushiol that will cause the rash. You will KNOW if you get this rash. It will be really an angry red, and super bumpy, and itch like you’ve never felt before. It will appear a few days after you were exposed, not usually right away. Some people say it can even take a week or two, although usually it does happen sooner than that. And when it does happen? You will not be confused. You will KNOW, in fact, that you have a rash. Poison Oak has nothing to do with oak trees. Like Poison Ivy, you can find this anywhere in the United States. 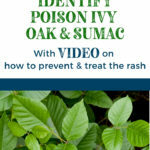 Also, like poison ivy, it has urushiol in all of its bits, meaning if you touch any of it, you will likely get a rash. Poison oak can seem a little like poison ivy because it has deep green leaves that grow in clusters of three on a firm stem. However, it also oftentimes has some yellow flowers that are hairy. Poison Oak also has fuzzy berries unlike poison ivy’s which are smooth. Just like poison ivy, you will KNOW if you get this rash. It will appear a few days after you were exposed, not usually right away. Some people say it can even take a week or two, although usually it does happen sooner than that. And when it does happen? You will not be confused. You will KNOW, in fact, that you have a rash. 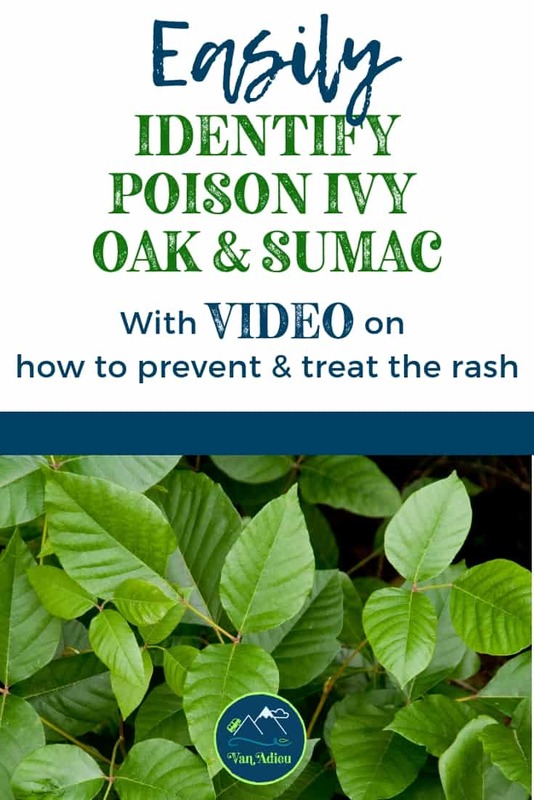 If you have been out among what you either realize, or even potentially THINK might be poison oak, you can come inside immediately and wash up. And when I say “wash up” I mean SCRUB. Everything I said about poison ivy, just copy and paste here: I am a HUGE FAN of this scrubbing product and poison ivy soaps that will help wash the goo off of you. 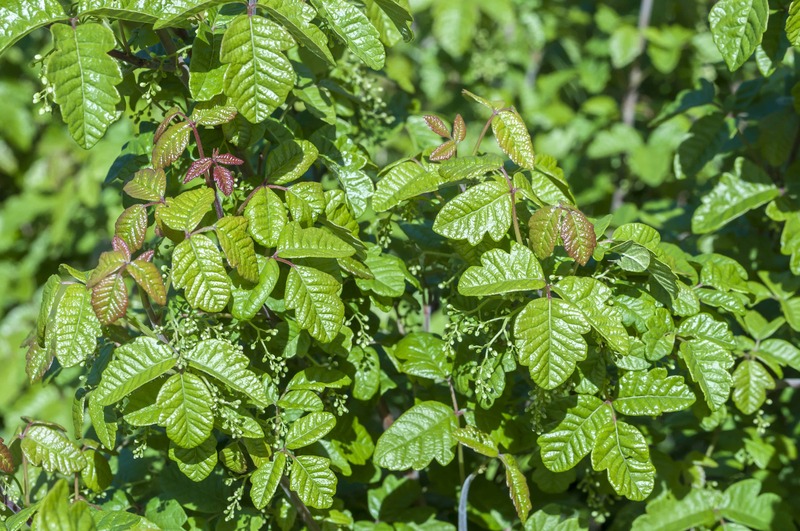 The symptoms of poison oak and poison ivy are almost the same, and so are the treatments. If you do end up with a poison oak rash, turn to a strong corticosteroid skin cream or ointment, or an anti-itch topical creams, which may help with the inflammation. Also, as always, check with your doctor, who may prescribe other medicine, especially if the inflammation is severe. 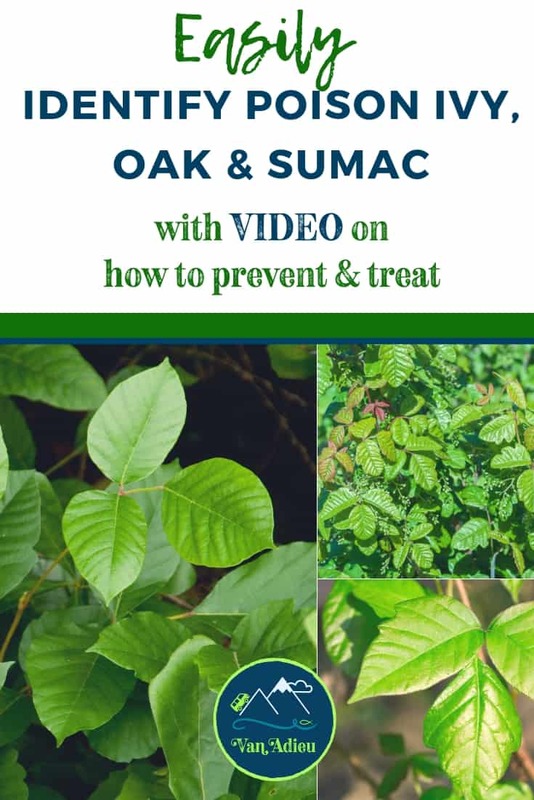 Poison sumac is different than the others. This plant usually is within a woody shrub that has stems that contain 7 to 13 leaves arranged in pairs down a stem. Many of them will have glossy, cream-colored, or pale yellow berries. The leaves can even be red! Other varieties will have leaves that can be green, yellow, orange……But note that the STEMS ARE RED. That is a great way to identify this plant. The bush can grow tall, as high as 10 feet or more, and some people even refer to it as a tree! This rash is going to be worse than poison ivy or poison oak. You will need to try to do the exact same things as above to prevent the rash. If you end up with it, then you will need to follow the same procedures as above. 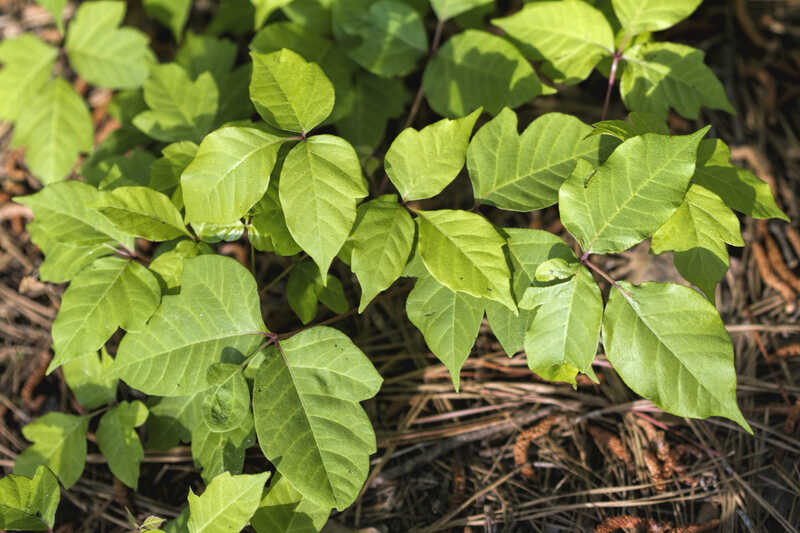 If you have been out among what you either realize, or even potentially THINK might be poison ivy, you can come inside immediately and wash up. And when I say “wash up” I mean SCRUB. I am a HUGE FAN of this scrubbing product that will help truly get a lot, if not all, of the poison ivy goo off of you. There are also poison ivy soaps that will help wash the goo off of you – but here’s the thing – a lot of it you just won’t be able to see. So, check your elbows, between your fingers, toes, etc. An expert from this website has done some research regarding this, and to be honest, I believe a lot of what he says is true. 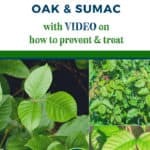 Check out his website, and also check out this video that shows that if you truly do scrub, you will have a lesser chance of having any kind of rash from a poisonous plant. 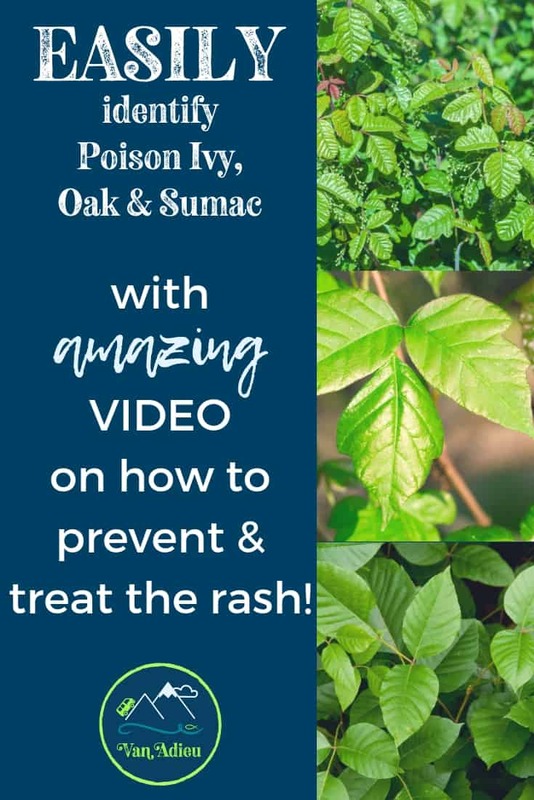 The one product that I swear by, and that I use every time I think I might even THINK about having poison ivy is ZANFEL – Poison Ivy, Oak & Sumac Wash.
Zanfel Poison Ivy, Oak & Sumac Wash is perfect for everyone! This product can be safely used by children, pregnant and even, get this!, nursing women. While regular products temporarily reduce itching but do nothing to remove urushiol, Zanfel treats the problem, not just the symptoms. It works to effectively remove urushiol from your skin by binding with it to create an aggregated cluster, which can quickly and effectively be washed away with water. 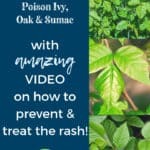 If you do end up with a poison ivy rash, turn to a strong corticosteroid skin cream or ointment, or an anti-itch topical creams, which may help with the inflammation. Also, as always, check with your doctor, who may prescribe other medicine, especially if the inflammation is severe. Other Plants to Watch Out For! 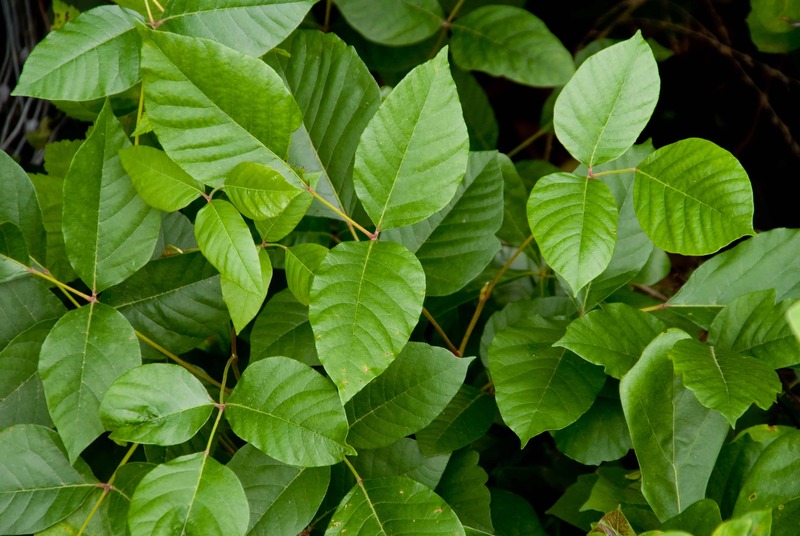 Poison ivy, oak and sumac are not the only dangerous plants to watch out for! Leadwort, Baby’s Breath (yes, Baby’s Breath), Stinging Nettle, Wood Nettle, Ragweed, Giant Hogweed, Cashew Nut Tree, are all examples of other common plants to watch out for. Pets can get these rashes, so keep your furry friends away from dangerous plants! These rashes are typically not contagious, but it’s a good idea to stay away from someone who has been in contact with these plants, because the oil might still be on their body and wipe off on to you! Have you found any ways that you can prevent rashes, or treatments that really work? We would love to hear from you! Leave your best tips and tricks below! 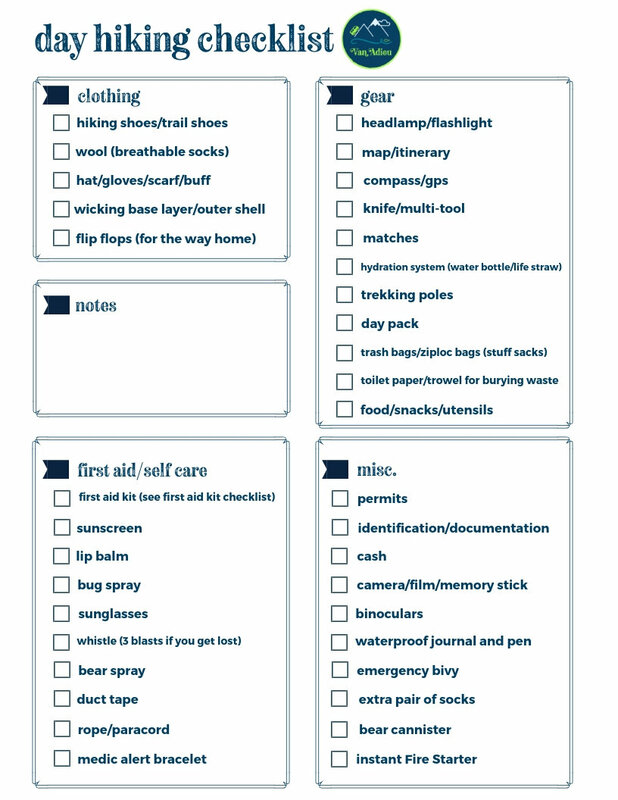 « Official Exclusive Road Trip Checklist – Reliable and Proven!